New talk for the conference “2D layered materials for opto-electronics: a theoretical/computational perspective” in Rome. 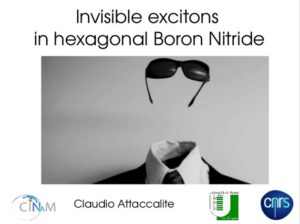 In this work we study excitations in hexagonal Boron Nitride that are invisible in linear optical response. We show that these dark states can be measured with other spectroscopic techniques and they play an important roles in the luminescence response of h-NB.